Does the space in which you’re currently writing inspire you to new heights of creativity or leave you utterly unmoved? If you’re not motivated by your working space you cannot write at your highest ability. Fortunately, you don’t have to make major redesign changes to reap the benefits of a surrounding that has the ambiance you require to write your most outstanding novels or stories. Check out the following writing area considerations – the “Four Cs” – and change the atmosphere in which you pen your imaginative pieces. Do you find yourself working wherever you can find a spot, whenever you have a moment? Though that might be acceptable for the short-term, you’ll probably need to carve out a more permanent place to write; otherwise, it will be difficult for you to really concentrate on your books, poetry, or plays. 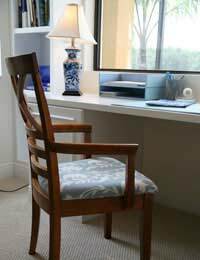 You don’t need a large amount of room to set up a writing area; even a simple desk with a computer or notepad occupying the corner of your bedroom will do as a starter “office”. In fact, some authors who live in cramped spaces have turned tiny closets into snug writing dens by rearranging clothes and installing some kind of shelving. Though such an area might not be spacious, it will at least have the benefit of being “the” place you can go to be with your thoughts. If you spend most of your time writing while hunched over a laptop in your bed or on the sofa, only to awaken each morning with a nagging pain in your neck and shoulders, it’s high time to find a more comfortable atmosphere in which to work. After all, it’s difficult to be inspired if you’re in distress. Though you needn’t spend the money on pricey ergonomically correct furniture as a way to solve this physical dilemma, you can certainly make sure you write in a more comfortable place and manner. For example, every so often, check your posture and walk around. If you’re working on the floor (yes, it does happen) or in an awkwardly tight spot, do your best to keep your body from tensing up. Remember – if you’re too uncomfortable to work, you’ll never be able to fully concentrate on your writings. Some writers love to work in a very noisy atmosphere, while others enjoy uninterrupted stretches of pure stillness. Depending upon your preferred “din” level, some alterations in your writing space might need to be made. For instance, if you tend to write in a busy, active place (such as a house full of kids or a cubicle smack dab in the middle of a phone-ringing customer service department) and you desire some peace during your writing moments, you may need to invest in headphones or even ear plugs. Conversely, if you crave the intensity of rock and roll music or constant chaos but you write in a practically silent area, you could always purchase an iPod, download some intense tunes, and feed your need for noise without bothering anyone else. Though you may like the feeling of having papers spread out before you on the table or desk, clutter can be a huge enemy of the prolific writer. Yes, it’s possible to ignore piles of documents… but not forever. Eventually, you have to tackle the mess, and if you become a professional author who works on a number of projects, you’ll need to be organised or risk losing clients. If you don’t currently have a system for keeping track of your work, invest in some manila folders; they are a great way to control the disarray of a messy space. A calendar, shelves (or filing cabinet), and wall-hanging bulletin board can be valuable resources, too, depending on how much room you have. Pay attention to the “Four Cs”, and you’ll be able to concentrate more on what you’re writing rather than where you’re writing.